When it comes to women film writer and critic Allan Felix (Woody Allen) is a loser. 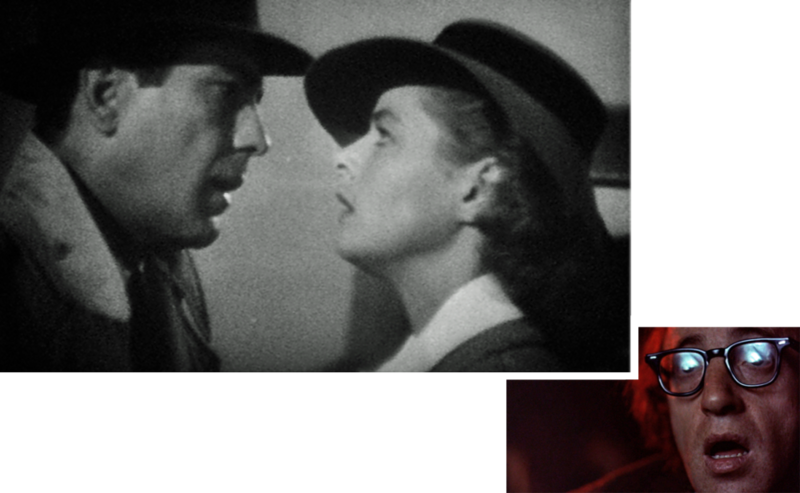 His wife has just divorced him and he seeks solace in a movie theater, enthralled by Humphrey Bogart in the classic Casablanca. 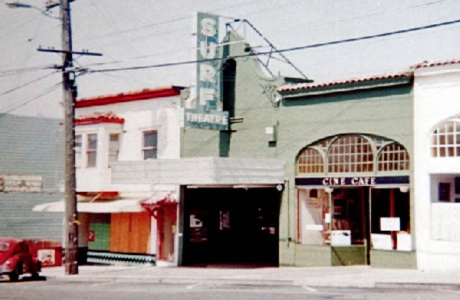 ... a vintage photo ... the scene was filmed in the Surf Theatre at 4510 Irving Street near Golden Gate Park in the Outer Sunset, a short walk from the surf of the Pacific Ocean (map). This 1970s photo shows the theatre as it was when the movie was filmed. Opened in 1926 as the Parkview Theatre, it changed its name to the Sunset in 1937 then was remodeled and rechristened as the Surf in 1957. During the 1960s and 70s the Surf became known for its avant-garde programming of classic and international films (perhaps explaining its choice by Woody Allen for this scene). ... and Now, the theatre closed in 1985; it has since been further remodeled and is now a church. Then ... He's mightily impressed by Bogart. "Who am I kidding", he muses as he leaves the theater, "I'm not like that. I never was, I never will be". Right from the get-go we see a lack of self-esteem prompting him throughout the movie to repeatedly turn to Bogart for advice. ... a vintage photo ... here's a matching view of the Surf taken in the 1980s by which time the seats had been replaced. Then ... Outside the theatre Allan walks by a cafe advertising a Bogart Festival. Its name is partially visible on the right - the Cine Cafe. ... a vintage photo ... the image shown earlier in this post - here it is again - shows the Cine Cafe at 4508 Irving right next door to the theatre. The cafe was opened and owned by the proprietor of the Surf Theatre, Mel Novikof. ... and Now, the Cine Cafe building has survived with the same decorative fenestration, now partially covered with an awning. Today it's a ballet school run by Ming-Hai Wu, a retired San Francisco Ballet soloist.